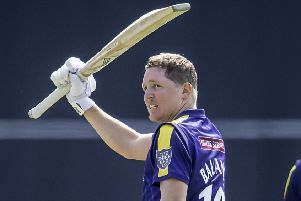 Yorkshire Vikings have banned one-day captain Alex Lees for two games, suspended for 12 months, for comments made to the media about umpire Martin Saggers after Friday night’s defeat to Nottinghamshire Outlaws at Trent Bridge. Lees has since issued an apology to Mr Saggers. The suspension is liable to be activated by, and under the terms of, the ECB Cricket Discipline Commission, should Lees breach any ECB Directive within the 12-month period. Lees, who has accepted the club’s decision, said: “I regret comments made following Friday night’s game and I would like to offer my sincerest apologies to Martin. “These comments are uncharacteristic and were made in the heat of the moment. Chairman of the Cricket Discipline Commission, Gerard Elias QC, stated: “I am grateful to Yorkshire County Cricket Club for taking such prompt and decisive action in this matter.